Weight: 22.31 g., 36 mm. 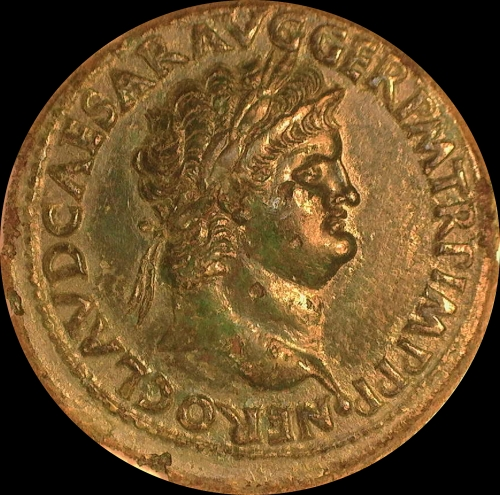 Nero, AE Sestertius, Lugdunum, 65 AD, 22.31 g., 36 mm. Obv. Laureate bust right with globe at point, nero clavd caesar avg ger p m tr p imp p p, Rev. annona avgvsti ceres, Annona standing right, holding cornucopiæ, facing Ceres seated left holding corn-ears, between them, modius, behind ship’s stern, s c in exergue. RIC 430; BMC 305; C 14; Sear 1952. Good very fine, glossy green patina. $11K. Provenance: ex Sir Arthur Evans Collection, Ars Classica Auction XVII (Lucerne), 3 October 1934, lot 1271 [acquired 1911]; bt Spink March 1936. Ceres, goddess of agriculture and grain crops, is closely connected to Annona, the divine personification of the grain supply to the city of Rome. With a vast population, the maintenance of a regular supply of food, water, wine and oil to the people of first-century Rome was of paramount importance. Since not enough food could be grown in Rome’s immediate environs, huge amounts of grain had to be imported, mostly by sea, from all over the empire. 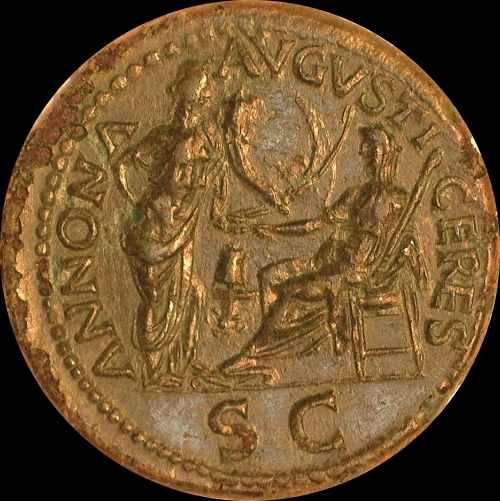 This coin was part of the imperial propaganda, reminding citizens, lest they take it for granted, of their good fortune to be living in such a well-run and generous state.